For other ships with the same name, see PS Waverley (disambiguation). PS Waverley is the last seagoing passenger-carrying paddle steamer in the world. Built in 1946, she sailed from Craigendoran on the Firth of Clyde to Arrochar on Loch Long until 1973. Bought by the Paddle Steamer Preservation Society (PSPS), she has been restored to her 1947 appearance and now operates passenger excursions around the British coast. Capacity: Up to 925 passengers in Class V waters. Since 2003 Waverley has been listed in the National Historic Fleet by National Historic Ships UK as "a vessel of pre-eminent national importance". PS Waverley is named after Sir Walter Scott's first novel. She was built in 1946 to replace a PS Waverley that was built in 1899, served in the Second World War as a minesweeper and was sunk in 1940 while helping to evacuate troops from Dunkirk. Shipbuilders A. & J. Inglis of Glasgow launched the new 693 tonne steamer in October 1946. She entered service with the London and North Eastern Railway in June 1947, working the LNER's Firth of Clyde steamer route from Craigendoran Pier, near Helensburgh, up Loch Long to Arrochar. In her first year in service she wore that company's red, white and black funnel colours. The 1948 nationalisation of Britain's railways brought their Scottish steamers into the Caledonian Steam Packet Company (CSP), a subsidiary of the Railway Executive, and the funnels were repainted yellow with a black top. In 1965 a Scottish red lion rampant was fixed to each side of both funnels. Waverley's hull was painted monastral blue until 1970. After a revival of fortunes in the 1950s, the 1960s saw a gradual change in holiday habits that led to a decline in passenger numbers and the closure of many of the small piers. Since 1969 and the formation of the Scottish Transport Group, the CSP had been gradually merging with the West Highland shipping and ferry company David MacBrayne Ltd. In 1973 the company became Caledonian MacBrayne Ltd (CalMac). CalMac withdrew Waverley after the 1973 season as she was too costly to operate and needed significant expenditure. By then the Paddle Steamer Preservation Society had been set up as a registered UK charity, and had bought the near-derelict small River Dart paddler PS Kingswear Castle. CalMac, keen to ensure that the ship was preserved, sold Waverley to the PSPS for the token sum of one pound. Neither side really believed that the vessel would return to steam but, just in case, Caledonian MacBrayne stipulated that she should not sail in competition with their remaining cruise vessel, TS Queen Mary. A public appeal was launched to secure funding for the return of the Waverley to service and the fund-raising operation was successful. The PSPS found itself running a cruise ship operation, "Waverley Excursions". Since then Waverley has been joined in the PSPS fleet by PS Kingswear Castle and MV Balmoral, and has had a series of extensive refits and much restoration work, including a new boiler and improvements to meet modern safety standards. She has circumnavigated Great Britain and every year makes extensive sailings around the country. Listed as part of the National Historic Fleet, between 2000 and 2003 the ship underwent a substantial rebuild and reboilering at the shipyard of George Prior at Great Yarmouth, funded principally by the Heritage Lottery Fund. The work was done in two stages, has added many 21st century safety and technological improvements and returned the ship to her original 1947 livery. In 2009 the ship was affiliated with HMS Defender, having hosted the official dignitary party at Defender's launch on the River Clyde. And in 2011 the ship was awarded the Institution of Mechanical Engineers 65th Engineering Heritage Award. Passengers passing the engine room see the huge piston rods driving the cranks on the shaft that turns the paddle wheels on each side. The supports here painted black are now painted green. 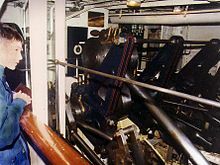 Waverley is powered by a three-crank diagonal triple-expansion marine steam engine built by Rankin & Blackmore, Engineers, Eagle Foundry, Greenock, Scotland. It is rated at 2,100 IHP and achieved a trial speed of 18.37 knots (34.02 km/h; 21.14 mph) at 57.8 rpm. Passengers can watch these engines from passageways on either side of the engine room. The main crank is solidly attached to both paddle wheels so they cannot turn independently of each other. The Waverley therefore has a much larger turning circle than modern ferries. Waverley has had several colour schemes in her life. Early photographs show paddle boxes painted sometimes white and sometimes black. The gold stripe along the hull is in some photos and not others. Today Waverley has the LNER 1947 livery of red, white and black funnels, traditional brown-grained (or "scumbled") superstructure and black paddle-wheel boxes, decorated with gold lettering on each side. Early photos show square windows instead of today's portholes. For most of her life the upper passenger cabins were painted white and had wooden doors; all have had layout improvements at some time in the ship's life. Sailing in all weathers in salt water can cause pale brown rust streaks to appear by the end of each season, so cosmetic painting and improvements are done annually as the ship is drydocked and checked by the Department for Transport. Since 1962, when PS Waverley's original funnels were renewed, replacement items had been slightly out of parallel due to their heavier welded steel construction. The problem was resolved in the 2000–03 refit and her two funnels are now parallel. Lifeboat arrangements have varied depending on the legislation at the time. Between 1975 and 1980 there was only one traditional lifeboat on the rear deck giving the ship an unbalanced appearance from the rear. Waverley's operators claim she is "probably the most photographed ship in the world". Today Waverley makes passenger excursions from various British ports. She regularly sails from Glasgow and other towns on the Firth of Clyde, the Thames, the South Coast of England and the Bristol Channel. She also undertakes private charters and provides a period setting for television documentaries and movies such as Sherlock Holmes: A Game of Shadows (2011). Mondays Glasgow - Largs - Ayr - Girvan - Round Ailsa Craig - Ayr. Tuesdays Ayr - Brodick - Millport - Largs - Dunoon - Blairmore - Cruise Loch Long and Loch Goil and return. Wednesdays Largs - Rothesay - Tighnabruaich - Tarbert - Cruise Loch Fyne, Arran Coast and return. Thursdays Greenock - Helensburgh - Dunoon - Rothesay - Largs - Millport - Brodick - Cruise Holy Isle, Pladda and return. Fridays Glasgow - Kilcreggan - Dunoon - Rothesay and return. Saturdays Glasgow - Greenock - Helensburgh - Dunoon - Rothesay - Tighnabruiach and return. Sundays Different cruises to places such as Lochranza, Campbeltown etc., from Glasgow. Her Clyde timetable ends at the end of August and Waverley spends 6 weeks between September and October cruising the Bristol Channel, the Solent and the Thames before returning to the Clyde for two sailings in October. Waverley at the James Watt Dock, Greenock, for a day's repair work on 13 July 2010, with MV Clansman in for more extended repairs. On the evening of Friday 15 July 1977 while returning from a cruise and approaching Dunoon pier, Waverley's steering failed and she struck the rocks to the south called The Gantocks. Firmly aground and down by the head the ship was extensively damaged. There was some doubt about whether or not she would hold together on refloating but she did, and she was repaired and returned to service. Her survival was attributed to her heavier than normal post World War II construction which had included provision for minesweeping gear and a deck gun in case she was ever requisitioned by the Admiralty for use in a future war. On 7 August 2006 Waverley ran aground while leaving Girvan pier, but she was able to return to the pier to allow her 715 passengers to disembark. On 15 September 2008 Waverley was involved in minor damage to Worthing Pier. After she berthed and secured lines to pier bollards, part of the landing stage was dislodged. The ship escaped damage and the only damage to the pier was that a length of timber was pulled out, but she had to leave without taking on passengers. On 26 June 2009 Waverley struck the breakwater at Dunoon, damaging both the ship and the breakwater. Some 700 people were aboard at the time, of whom 12 suffered minor injuries. The ship returned to Glasgow, where the damage was assessed. One week later she was back in service on the Clyde. On 25 August 2017 Waverley struck the wall of the promenade at Rothesay, Bute damaging the bow of the ship. There were no reported injuries to passengers or spectators. Her final two cruises of the Clyde summer season were cancelled while the damage was assessed. After repairs to her bow, Waverley quickly returned to service in September 2017. On 25 August 2018 Waverley broke down due to a problem with boiler controls. The ship was on the Clyde between Greenock and Helensburgh for several hours before making it to Greenock. ^ "Latest AIS for Waverley". ShipAIS. Retrieved 21 December 2009. ^ "PS Waverley". Clydebuilt Ships Database. Retrieved 4 January 2008. ^ "Waverley". National Historic Ships. Retrieved 28 September 2010. ^ "Royal Navy Defender". Ministry of Defence. Archived from the original on 13 July 2011. Retrieved 19 August 2011. ^ Down to see the Engines. Waverley Excursions Ltd. 1985. ^ "Waverley". Waverley Excursions. Archived from the original on 17 August 2009. Retrieved 14 September 2007. ^ a b "Waverley runs aground carrying 715 passengers". The Herald. 8 August 2006. Retrieved 12 August 2017. ^ "Paddle steamer 'hits end of pier'". BBC News. 16 September 2008. Retrieved 16 September 2008. ^ "Steamer grounded after pier crash". BBC News. 27 June 2009. Retrieved 6 May 2010. ^ "Clyde cruises cancelled after Waverley crashes into pier". BBC News. 25 August 2017. Retrieved 25 August 2017. ^ "Paddle steamer Waverley cruises to resume after pier crash". BBC News. 1 September 2017. Retrieved 6 September 2017. ^ "Passengers stranded as Waverley breaks down". BBC News. 25 August 2018. Retrieved 29 September 2018. McCrorie, Ian (1986). Clyde Pleasure Steamers. Greenock: Orr, Pollock & Co. pp. not cited. ISBN 978-1-869850-00-5. Wikimedia Commons has media related to PS Waverley.